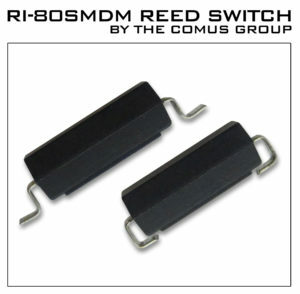 The Comus Group is proud to introduce our first overmolded surface mount reed switch, the RI-80SMDM Series. The new RI-80SMDM series uses our Comus Technology BV ATE (automatic test equipment) grade 5mm sputtered ruthenium contact reed switch molded in a rugged plastic SMD package ideal for portable electronics, medical and proximity sensor applications. The RI-80SMDM series are available in industry standard Gull and J lead forms for upgrading existing designs with 100% parametrically tested after molding and lead forming for improved reliability.